Blog / Landscaping / Water Management / April Showers Bring…Stormwater! Torrential downpours all too often dash gardeners’ hopes for gentle rains to bring us May flowers. Stormwater runoff from heavy rains may drown tiny plants and cause erosion. Fortunately, with some planning you can maximize the benefits of rainwater in your landscape and minimize potential damage. 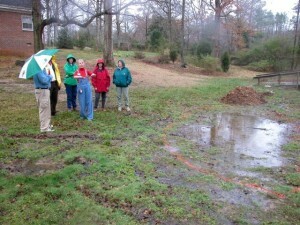 Ideally, even heavy rains will soak into the ground and perk up our plantings on the way to replenishing groundwater. Because we have so many paved areas around our homes—roads, sidewalks, driveways—and other impervious surfaces, such as our homes’ roofs and compacted ground, much of the water from storms just runs off. Where it goes depends on the route to the nearest creek or other body of water. Runoff not only takes away water we’d like to keep for our landscapes, it often carries away landscaping materials such as fertilizers, mulches, pesticides and soils, causing unsightly erosion and polluting our waterways. In extreme cases, mud and rocks slide, too, sometimes carrying away trees or even homes. The basic principles of stormwater management are to “Slow it Down, Spread it Out, Soak it in.” Look at your property when it is raining. You’ll often see that much of the water on the ground is coming not only from the sky, but also from roads and other properties. You may notice water pooling in low areas or flowing hard from downspouts or steep slopes. Approaches to managing stormwater can range from reducing impervious surfaces in your yard to slow down and spread out runoff, while adding more plantings to soak up that rain, to consulting professionals about features such as rain gardens, retention ponds or better drainage solutions.